Lauryn Hill is sitting on top of the world. The thing I am the most proud of, is that she is there on her own terms. She is riding the delicate balance of cross-over appeal while keeping her integrity as an artist. The music in her first solo album perfectly reflects her development from the Fugee family. It's important to me that she is able to have creative freedom in the male dominated industry, and even more important that she is not the visual image that the media "tolerates". The sister has chocolate brown African features, and through her success, the media will be forced to do what it does best. That is, to take this image and market it in other products. African Americans can be universally appealing. The sister beat out Madonna and Shania Twain. This is like a grand slam at the World Series. 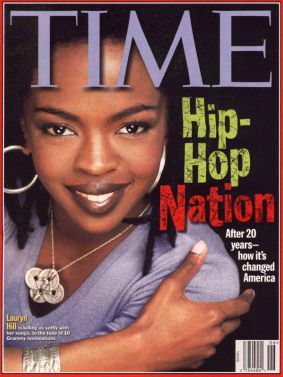 Unlike so many others that make it, Lauryn will not use her time in the sun to downplay the obvious, to neutralize the significance of where she is. She will take the culture to the masses with style and dignity, and use her fame to shed light on the areas that go largely ignored. Sounds like I know her, right? I feel like I do. She feels that genuine. She is destined for Aretha Franklin's level of impact. Maybe that's the hint we got in their recent collaboration. I feel an excitement about the possibilities that lay ahead for her. I can't think of a more deserving artist to carry the torch, and to represent where hip hop is after 20 years.